In Hindu philosophy, destruction is considered to be an intense force that shatters delusions and inadequacies bringing forth constructive change through purification. The most powerful member of the triumvirate, Lord Shiva the Destroyer is observed as a complex godhead whose existence fuses conflicting elements. He is believed to be the core of the centrifugal forces of the cosmos due to his role in death and destruction. He dissolves elements in order to create and hence propels the cycle of birth and death. The most formidable deity of the Hindu pantheon is the ultimate seat of ‘Shakti’ and cataclysmic power. With multiple incarnations portraying different shades of Lord Shiva, each has cults which are present across India and South East Asia - in Nepal, Sri Lanka, Malaysia, Singapore and other places. From the days of Mohenjodaro civilization’s prototype Lord Shiva representations to Vedic literature, Puranic literature and Tantric literature, all of which consist of renditions about Lord Shiva, the Pure One in some form or the other. Known for his feral passion and fearful temperament, Lord Shiva is said to be the greatest ascetic Mahayogi (the Patron God of Yoga and Meditation), passively refraining from all forms of desires and pleasures. At the other end of the spectrum, he exists as hedonist Bhole Nath or Bhole Shankar. Lord Shiva is given the title of the ultimate self-controlled entity abounding in serenity. Contrastingly he is the volatile dancing Nataraja engulfed by wafting flames. Whether Mahadeva or Pashupati, Kala Bhairava or Vishwanath, Mahesh or Bhava – the original rebel is truly the most fascinating Deva. He is the most potent energy in the universe despite being one of ambiguity and paradox. At the highest level he is infinite, transcendental and formless. 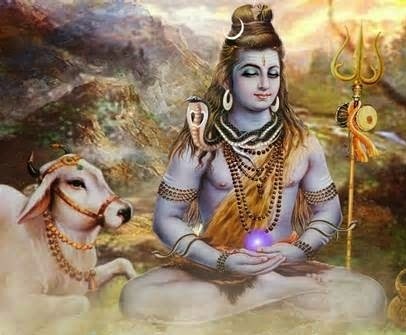 The oldest sect of Hinduism Shaivism regards Lord Shiva as all in all - the creator, preserver, destroyer, revealer and concealer of all that is in existence. The Lord of Destruction is generally worshipped in the an iconic form as a Lingam (phallus) but is personified as an ascetic on Mount Kailash or as a domestic partner to Goddess Parvati with two sons Lord Ganesha and Lord Kartikeya and even as a cosmic dancer. His forms are thus both compassionate and terrifying. Shiva’s eternal wife Parvati is an incarnation of his consort Devi, the Mother-goddess. Devi has taken many forms such as Kali, the goddess of death and Sati, the goddess of material felicity and Durga, the invincible goddess, all of whom are linked to the various forms of Shiva. Lord Shiva the absolute image of masculinity and virility is very distinct in his appearance. He is unlike any other god with his unique get up. His tresses are gloriously piled high on his head with the River Ganges gushing through his matted hair and a resplendent crescent tucked deftly into it. Coiled around his neck is the mighty serpent Kundalini, which is the spiritual energy within life. He wears circular hoop earrings and has a third eye on his forehead. The Transformer’s body is smeared with holy ash or ‘vibhuti’. The ashes embody the final truth that mortals face - the end of all material existence. Lord Shiva also wears his favorite ‘rudraksha’ beads, which is a representation of deep happiness. In his left hand Lord Shiva carries a small leather drum, known as ‘damru’ and on his right he holds a water pot. He sits upright on a gorgeous tiger skin, which denotes the conquering of lust. At other instances, the Lord of Destruction rides his famous ‘vahan’ Nandi, the bull, who is decorated with beautiful garlands. In the sanctum sanctorum of most temples, the male phallic symbol the Lingam is housed. It is usually placed beneath the spire where it depicts the naval of planet earth. This symbolic image represents both the microcosmic and macrocosmic echelons of the energy that sustains life. It supports life on our planet and also constitutes the life force of the entire universe. Lord Shiva’s sacred number is five. One of his supreme mantras (the chant na ma si va ya) has five syllables. The Great Benefactor’s body itself is composed of five mantras – called pancabrahmans. These are all forms of divinity with distinct names and iconography. Sadyojata, Vamadeva, Aghora, Tatpurusha and Isana are represented by the five faces of Lord Shiva and are associated with the five elements, the five senses, the five organs of action and the five organs of perception. Across India, Mahashivaratri is celebrated on the 13th night of the new moon in the Krishna Paksha of the month of Maagha or Phalguna of the Hindu lunar calendar. It marks the night of the original Tandava when Lord Shiva and Goddess Parvati unite in holy matrimony. There are many special prayers and customs. Abhishekams are performed every three hours through the night with offerings like milk, yogurt, honey etc. Bael leaves are also offered ad they are a good sign for a successful life. These are placed much importance to the level of believing that even if those who do not seek blessings place these wreaths, they are endowed with a great life. Since the Lord of Destruction is related a dark power. Hence to subside negative energy, he consumes opium. His form of Shiva, Bhole Shankar is oblivious to happenings. As per Hindu traditions, on the night of Mahashivratri, devotees especially men, prepare an intoxicating drink called Thandai made milk, almonds and cannabis while offering their prayers. They sing devotional songs and dance to the rhythm of damrus. In fact dance is an import part of Indian culture. Lord Shiva is the master of the art form and is often referred to as the Lord of Dance. He is most active as a dancer as Nataraja and Dakshinamurthy. The rhythm of dance is an allegory for the delicate balance of the cosmos. His most famous dance is the tandav, the cosmic dance of death. He performs this at the end of every age or yuga. In Indian spirituality, Lord Shiva commands a high position. He is wise and dynamic, fearless and fierce…the ultimate rebel who has charmed thousands of generations over annals of time.